I am troubled by the unfettered, unrestrained, sentimentality, and emotionalism, being celebrated on modern television over animals, and their rescue. I don’t want to seem cold, or cruel, but this is beyond what should be morally, and ethically permitted in light of human poverty, abuse, and suffering, around our country. We’ve aborted approximately 70,000,000 babies since the not-so-Supreme Court invented a woman’s right to murder her, and the father’s child. Think about that number. Seventy million human children murdered in the womb, and everyone gets hysterical over the mistreatment of a puppy. Many of you are familiar with PETA (the idolatrous animal rights terrorist group.) and their mantra of, “A Rat Is a Pig Is a Dog Is a Boy.” This insanity has come from the void left by removing Christ, and Christian education from our country. It has allowed for this idolatrous transference of worship. Instead of worshiping God, they worship the creation. Christian teaching informs us to the intrinsic value of human life above all other life on the planet. For unlike the creatures of this world, God in His sovereign will, made man in His image, and made him a little lower than the angels. Man is the only being that God created who has a spirit. We are definitely not to be equated to a dog or any other animals. Only a godless heathen would equate human life to that of another animal. Anyone who is Christian cannot do so in a way that is consistent with scripture. “1 And God blessed Noah and his sons and said to them, “Be fruitful and multiply, and fill the earth. 2 “The fear of you and the terror of you will be on every beast of the earth and on every bird of the sky; with everything that creeps on the ground, and all the fish of the sea, into your hand they are given. 3 “Every moving thing that is alive shall be food for you; I give all to you, as I gave the green plant. 4 “Only you shall not eat flesh with its life, that is, its blood. 5 “Surely I will require your lifeblood; from every beast I will require it. And from every man, from every man’s brother I will require the life of man. You see, it is evident in the word of God that we are to eat the other animals as food. He has given them to us as food just as He has given us the plants to eat. 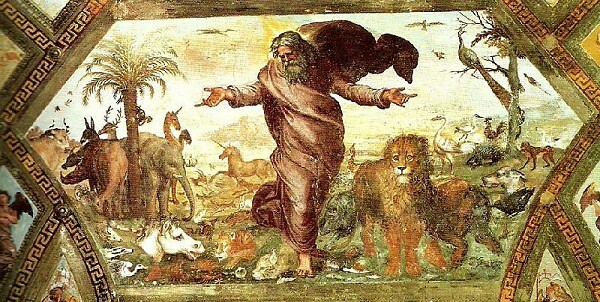 He has also elevated man above the other animals by saying in verse 6, ““Whoever sheds man’s blood, By man his blood shall be shed, For in the image of God He made man.” Do you see it? We are made in His image. Do you see that the murder of a man requires the execution of the murderer? It is a sin against God to steel a man’s life by killing him unjustly. The person who murders makes themselves out to be god. Not only are they guilty of murder, they are guilty of theft, idolatry, blasphemy, and hatred. By destroying an image bearer of God they have blasphemed. None of this is true of anyone who kills an animal. God has given us dominion over them, to use as He intends. If you don’t believe me about how horrible this godless doctrine is, let’s examine the ethic in practice with a theoretical situation. For instance, a rat, pig, dog, and a boy, are all in a river about to drown. The rat is closest to the bank, and it is more likely that you would be able to successfully rescue it. The boy is the furthest out, and least likely to survive. The pig and the dog are between the rat, and the boy. According to the ethic, you should attempt to save the rat, because they are all equal in value to the atheist. To do anything else would be immoral according to their belief. I think most of you would agree, seeing a young child drowning and saving a rat is immoral. Whether you know it or not, you have been raised with a Christian ethic. That isn’t so for many of our children. They are being raised in a postmodern, secular, atheistic, world. Unless you can, in the limited time you have with them, negate the 8 hours a day the school spends with them, they are not going to share your morals. You see, without God and His word as the foundation of our worldview, we will lose our collective minds and become a society in decay. The foundation of our freedom and prosperity has been faithful obedience to God and His gospel. As a nation, we were founded on the ideals exampled by Christianity. Without the example of divine grace, and the laws that made grace so sweet, we will necessarily vote for increasingly immoral things. Without moral absolutes determined by the immutable God, we will continue to abort babies. We will also begin to euthanize the ill and elderly. Pragmatism will override the fact that we are made in the image of God. When your medical system is based on pragmatically cutting costs and saving money, instead of attempting to cure illnesses, and heal people, the end result is murder by bureaucracy. I pray Lord that we will repent, and always value human life above that of mere animals. I pray Lord that you will give every person in this nation and around the world the knowledge that abortion and euthanasia are morally wrong.